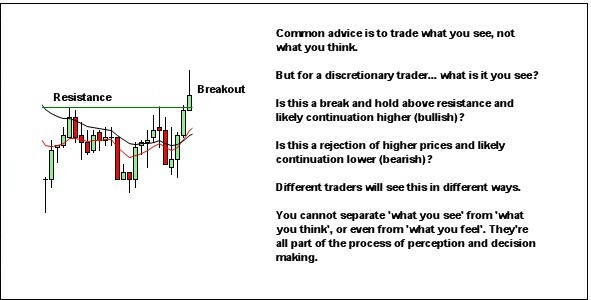 Common advice is to trade what you see, not what you think. I've never been comfortable with that advice. As a discretionary trader, it just doesn't make sense. We're not machines; what you see is determined in a large part by what you think, and in fact by what you feel. Awareness involves more than just seeing. Seeing is just one part of perception, but then you also need to understand the meaning behind what you perceive, and be able to project that forward to understand it's meaning for the future. And that whole process will be distorted by any number of physiological, psychological and environmental influences. Add in the uncertain market environment, and it's a recipe for doubt and anxiety. Where is price going next? This is what makes discretionary trading so difficult. You don't know. You can never know. Movement from your entry point is dependent on the net orderflow from all orders placed AFTER your order transacts, and that is a function of other traders decisions and actions in the market. You can NEVER know with certainty what the outcome will be. Trade entry is always subject to doubt. And you will always be subject to anxiety. Guaranteed! And any price movement from the entry point will provide further anxiety, regardless of whether that movement takes the position into profit or drawdown. A drawdown will increase anxiety. "Was I wrong? ", "Am I just early? ", "I can't afford another loss!" A profit will increase anxiety. "Has it got further to run or not? ", "Should I just take the profits here? ", "What if it reverses and takes away all the profits?" It might seem then that the answer is in automating the strategy. Unfortunately not! That just shifts the anxiety to different stages of the trading process. If you try automating the entry through objective rules you'll still be subject to the same anxiety throughout the trade management process, along with some new ones; "I just knew that was a bad entry! ", "Maybe my entry rules need tweaking!" Completely automating the whole trade entry, management and exit process (becoming a systems trader) simply shifts the doubt and anxiety to the systems design and management processes, rather than trade management; "Maybe the current market environment is not ideal? ", "Maybe I need to adjust parameters? I'll just run some more tests and see if we can optimize this better." So, what's the way forward? It's not about trading what you see. It's about learning to trust yourself when you're unsure what the future holds. Progress will only be made when you stop fighting reality; that is when you stop seeking rules or techniques to provide certainty. Certainty is illusion, and cannot be achieved. Progress will be made when you start working with the reality; learning to operate and manage risk within an environment of uncertainty. Develop a strategy based upon the reality of the market environment – identify areas on the price chart which will likely be sources of other trader orderflow. And then learn how to exploit those areas. Study decision making, in particular as it relates to uncertainty! And implement processes of deliberate practice; learning to trust your strategy and your ability to trade it despite any doubt and anxiety, through a process of trial and error (what I call the Trade-Record-Review-Improve process). It's not about learning and trading patterns. It's all about a gradual process of "becoming" a trader.